If ever there were a darling of the DIY world, chalk paint would be it, thanks to its unique ability to transform outdated furniture into Insta-worthy superstars with virtually zero prep. No longer do you have to spend hours and hours sanding and priming, since the ultra-thick formulation sticks to just about any surface and lets you skip right to the painting. 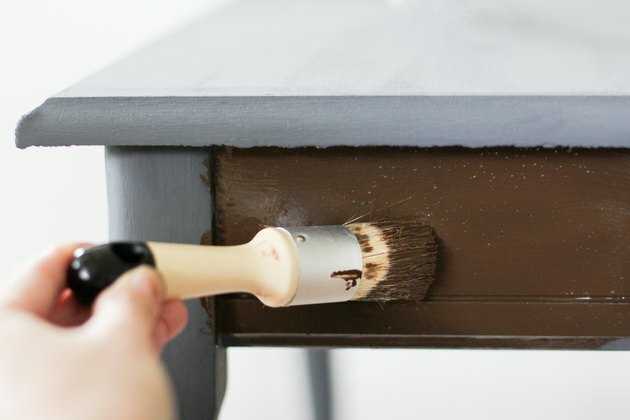 It's so easy to work with that it turns even your biggest furniture makeovers into simple one-day projects — you can literally paint in the morning and put it back in place by the afternoon. The result is a gorgeous, velvety matte finish that can be left as-is or strategically sanded for a distressed look. Whether you're aiming for a modern minimalist style, farmhouse vibe, or vintage Parisian flair, we've got all the deets you need to chalk paint like a pro. Just what exactly is chalk paint? Not to be mistaken for chalkboard paint (which produces a writeable surface that you can erase), chalk paint is a latex-based decorative paint mixed with a finely ground powder substance, often calcium carbonate or plaster of Paris. The small granules thicken the paint, allowing it to cling easily to surfaces, and dry to produce a chalky finish, hence the name. It's particularly popular for lending a distressed, antique-style look to painted furniture. Technically the term Chalk Paint® was developed and trademarked by Annie Sloan, but many other brands (including Joanna Gaines and Martha Stewart) have since followed suit with similar products you'll find labeled "chalk style" or "chalky finish." How's it different from latex or oil-based paint? 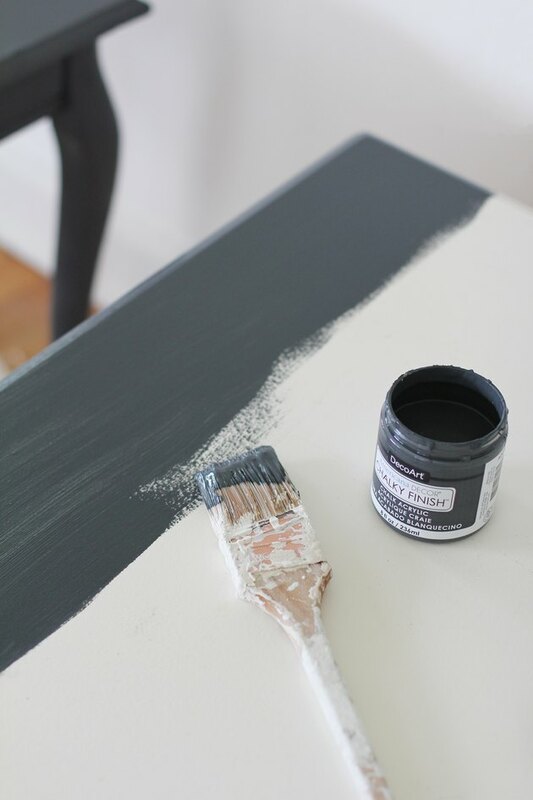 While standard paints come in a variety of sheens, chalk paint always has a matte finish. The chalky texture has great adhesion, allowing it to cling to even varnished or glossy surfaces without sanding, priming, or stripping — its greatest attribute, for sure. Because it has great coverage, sometimes you can get away with painting just a single coat, so you can purchase less than you'd need with traditional paint. It dries very quickly, so if a second coat is needed, you'll only need to wait about an hour between coats. Also, it has low levels of volatile organic compounds, or VOCs (hooray for no icky gases! ), so you can paint indoors, which is actually an ideal environment for working with this type of paint, since you can control the temperature. Working outdoors in the sun and wind can make the paint dry faster than you can paint it, resulting in streaky or uneven application. What can I paint with it? 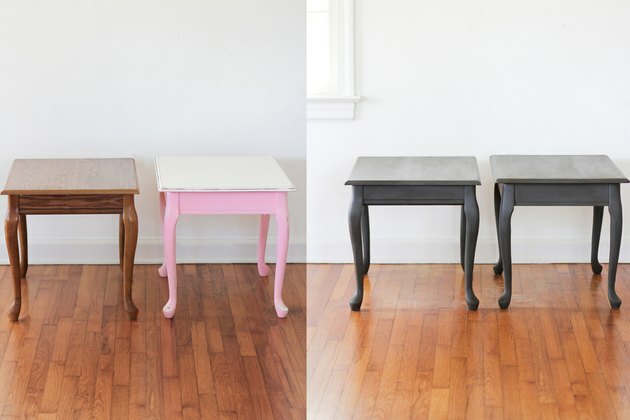 Chalk paint works on just about any surface, including wood, laminate, metal, glass, concrete, brick, even upholstery. The sky's the limit with what you can paint, but a few at top of mind are: furniture, cabinets, walls, floors, tiles, picture frames, lamps, and a whole lot more. Simply mix the plaster of Paris and cold water thoroughly until combined. Then stir the mixture into the latex paint. Start with 2 tablespoons of water and mix it into the calcium carbonate until completely dissolved. If it's too thick, add another tablespoon of water (you're going for the consistency of ranch dressing), and then stir the mixture into the latex paint. Behold your chalk paint! Glad you asked. We recently thrifted two Queen Anne-style end tables that had great vintage lines but were definitely lacking in the beauty department. In fact, one had a dingy brown laminate on top, and the other, despite being solid wood, had previously been painted white and pink (gah!). 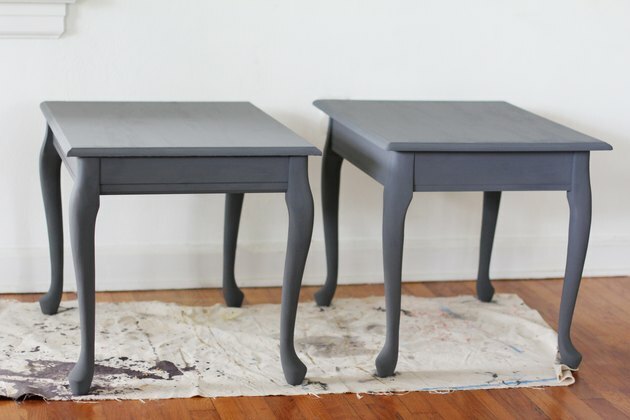 Chalk paint was just the thing needed to transform them into a matching pair fit for the modern age. Below we're taking you step-by-step to show you exactly how we did it, and how you can do it, too. Step 1: Start with a good cleaning. 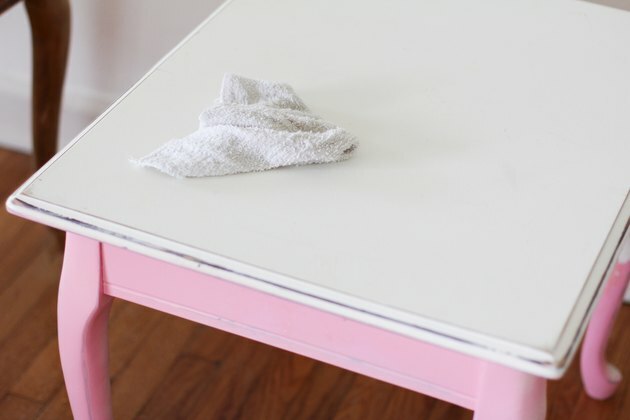 Place a drop cloth under your furniture, and start by giving it a thorough cleaning. If it's not too dirty, a washcloth with regular soap and water should be enough to remove light dirt and oil. But for heavy grime, wipe it down with mineral spirits, or with a diluted mixture of denatured alcohol and water (50-50 ratio). Be sure to let it dry completely. 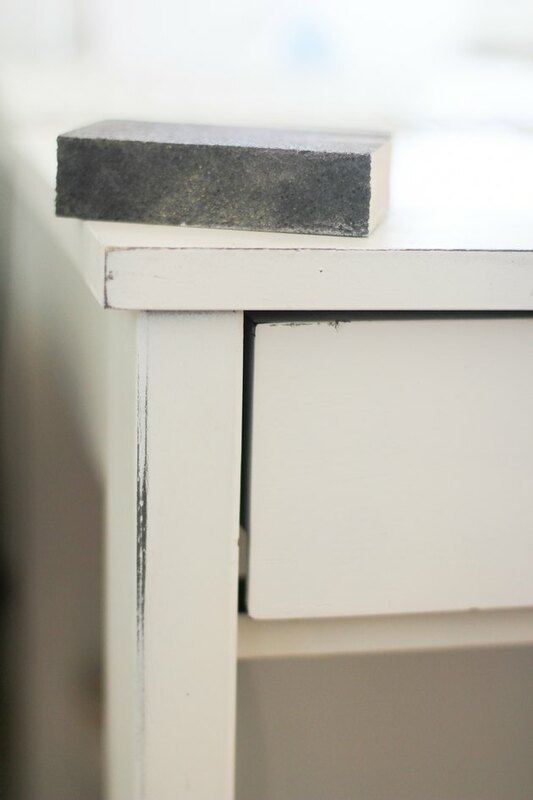 If your furniture piece has any hardware (ours didn't), go ahead and remove that now, and use painter's tape to protect any areas that you don't want painted. Step 2: Sometimes you can't get out of sanding. Before getting started, we put on a respirator mask and did a quick lead test, since we weren't sure of the table's age or origin. We then used a medium-grit sandpaper to smooth out all the bubbles and create an even surface for painting. You can do the same for pieces that are peeling or chipped, but for any deep gouges or scratches, you'll need to fill those areas in with wood filler, and sand them smooth once dry. 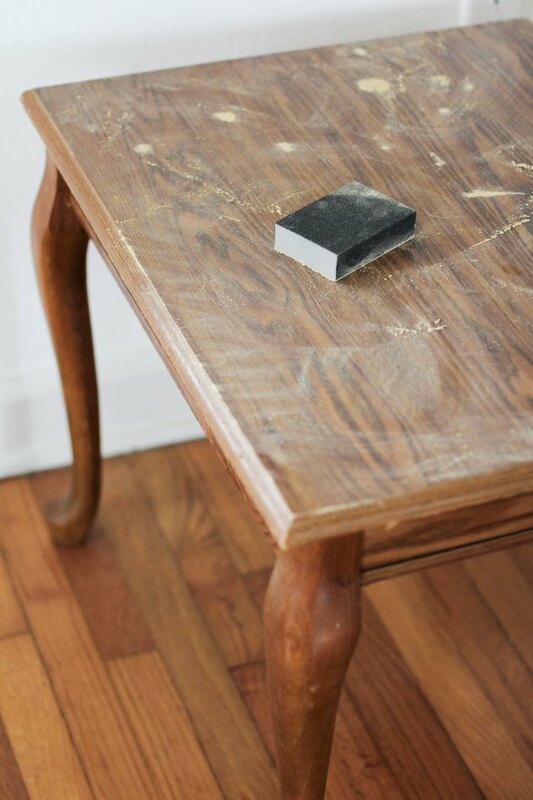 Be sure to wipe away all of the sanding dust with a lint-free cloth. Step 3: If this applies to you, prime with shellac. Since we weren't painting bare wood, we were able to skip right to painting. However, if you are working with a raw wood piece, especially one with an open grain or a lot of wood knots, then you'll definitely benefit from applying a coat of clear shellac before painting. This is to avoid what is known as "bleed through," when the tannins in the raw wood seep through and alter the paint color. Sometimes, bleed through can also happen when you paint with a light color, often white, on top of a very dark-stained piece that previously had an oil-based finish (common in pieces from the 1930s and 1940s). So while it's not required, if this applies to your painting situation, you might want to consider applying a coat of shellac before painting your first coat. Or you can paint the first coat and then examine whether there is any bleed through after it dries. 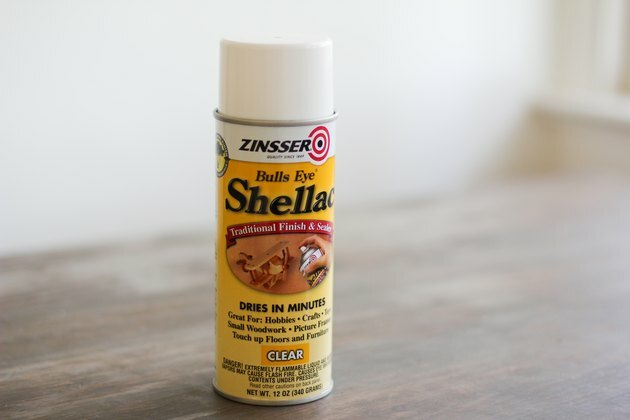 If you notice any areas with bleed through, simply apply shellac to those areas. The great thing about shellac is it dries lightning fast, so you won't have to wait but a few minutes before painting your second coat. Step 4: OK, let's paint! Now for the fun part — painting. First things first, shake or stir your paint can well to ensure the pigment is evenly distributed. As for which brush type you should use and the methods of application, let's go over some options, shall we? Chalk paint brush: This is a rounded paintbrush usually made with natural bristles. Because the bristles are stiffer than a regular paintbrush, it creates more of a textured finish, which is great for producing that vintage look. This is the same type of synthetic bristle brush you'd use with regularlatex paint. 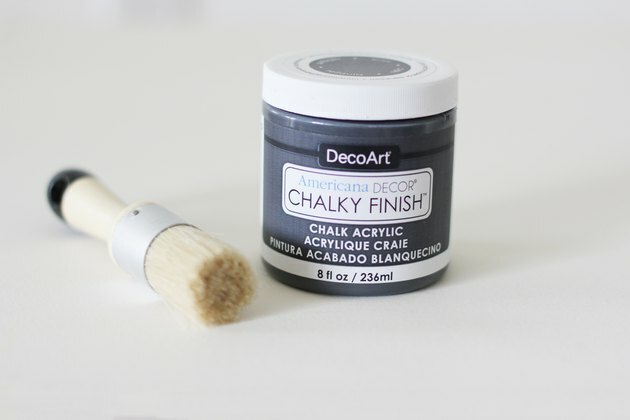 It creates a smoother finish than a chalk paint brush for a more contemporary finish. High-density roller with 1/4-inch nap: You'll get a smoother, stroke-free finish with a roller brush. 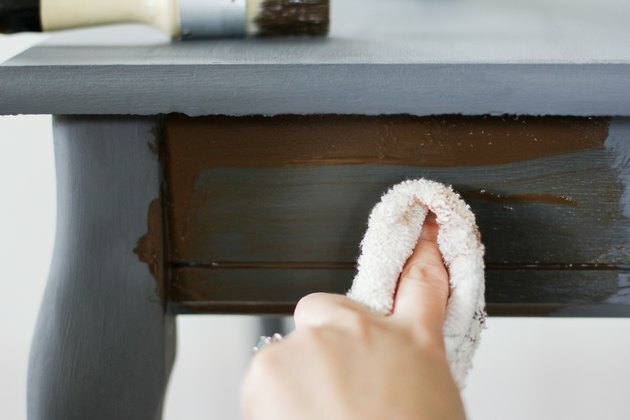 Since chalk paint is so thick, roller brushes can tend to grab a lot of paint when you dip it into the tray. Be sure to remove as much excess paint as possible from the roller before rolling it onto the furniture. To create a textured finish that gives more of an antique-style look, use a chalk paint brush and paint in every direction using short haphazard strokes. The fun in this technique is the freedom to be messy and imperfect. If a second coat is needed, paint in the same manner as the first. A: If you want to smooth out some of the texture, you can "feather" the wet paint, which essentially is brushing over the stroke marks with very light pressure until smooth. B: If you want to create more texture, you can "stipple" the wet paint, which is dabbing your brush on and off the paint to create small peaks and valleys. 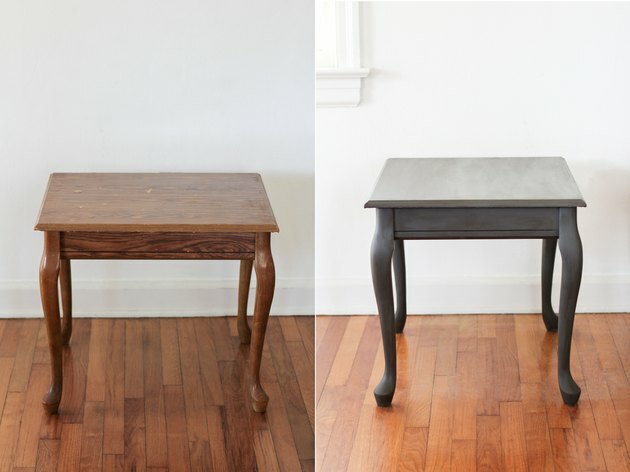 This technique is great for hiding flaws or imperfections in your furniture. 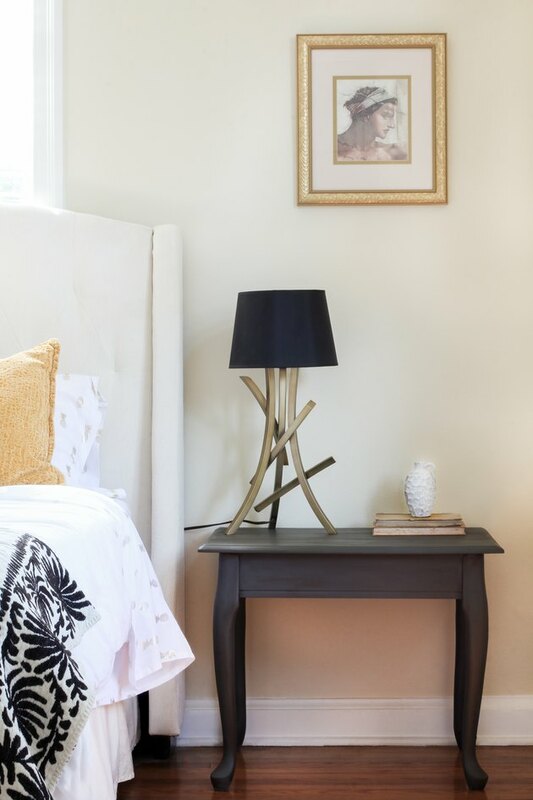 Smooth Finish: To create a smooth, more contemporary finish, use either a flat brush or a high-density roller and paint in one direction using long continuous strokes. If a second coat is needed, paint in the opposite direction as the first coat, again using long continuous strokes. 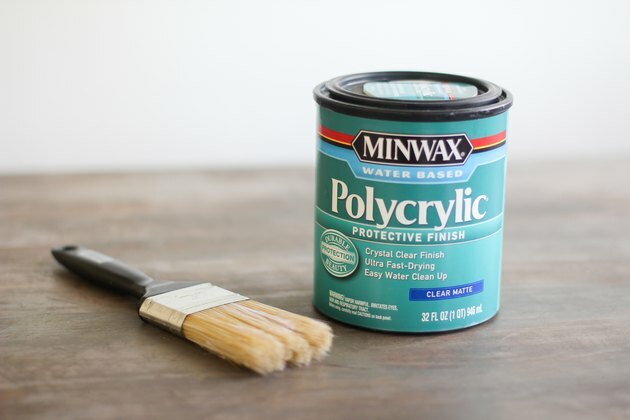 You could also water down the paint by either dipping your brush in water before dipping it in paint, or by mixing some of the paint with 1 to 2 teaspoons of water. This will create a thinner consistency, which will further diminish brush marks. 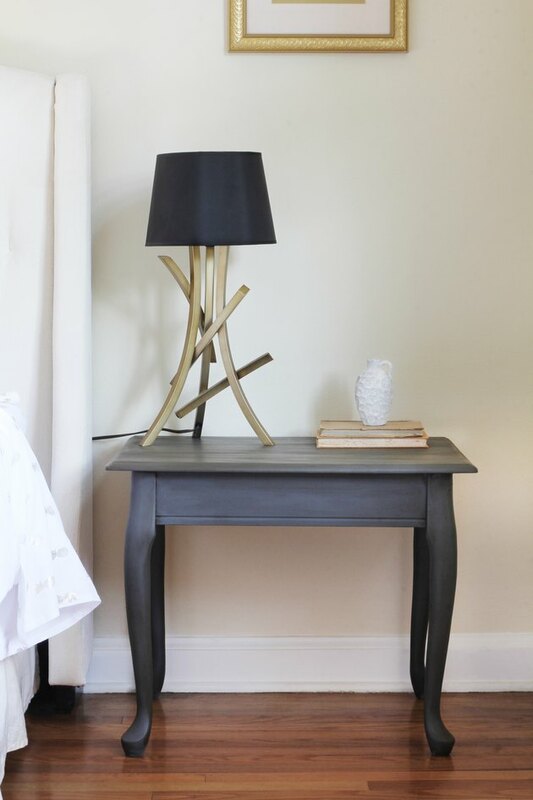 TIP: It's important to note that even though one coat can adequately cover some furniture pieces, two coats are recommended for a more durable finish. 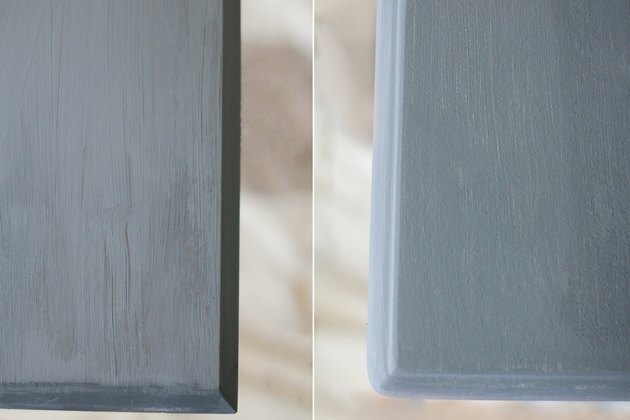 One of the advantages of chalk paint is that it's easy to create a distressed look by strategically sanding the paint off in certain areas. 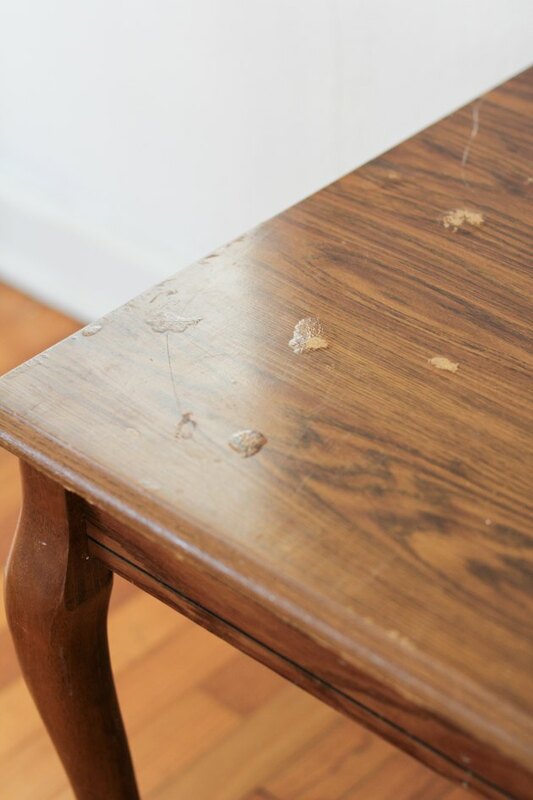 If you opt to distress your piece of furniture, use a medium-grit sandpaper and sand in areas that would normally be weathered by time: along the top, edges, corners, high points, and on any raised decorative details. Start lightly, and work up to a medium sanding pressure, as it's easier to sand more off and regret sanding off too much. You can also sand the corners to round them out for a more genuine weathered look. Since chalk paint has a powdery finish, there will be a lot of sanding dust, so be sure to wipe it all off when you're done distressing. Step 6: Wax on; wax off (literally). 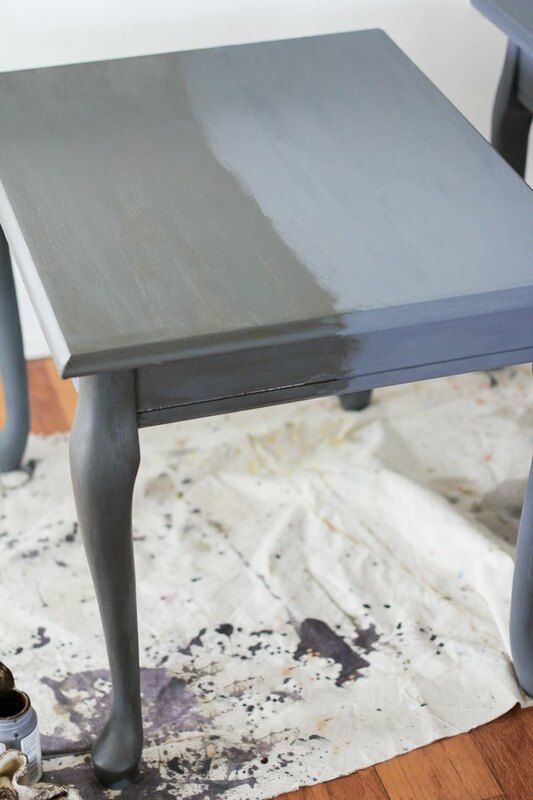 After painting your furniture, you should seal it with a topcoat to protect the paint from scuffs or scratches. 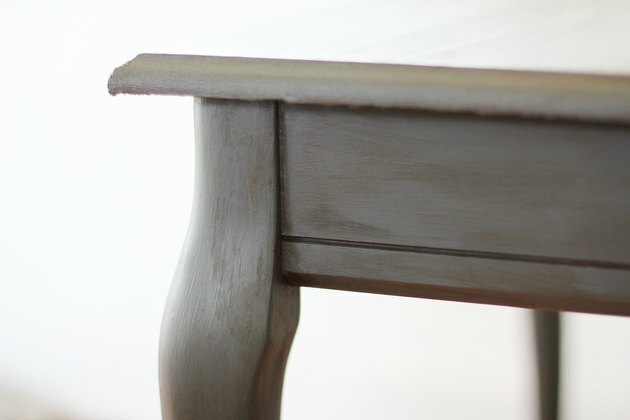 By far, the most widely used topcoat for chalk paint is clear wax (like this one or this one). It's well loved by many because when you buff it into the paint, it creates a velvety lustrous sheen. Many also use it in conjunction with dark wax (also known as antiquing wax), which you can use to create an authentic-looking aged patina, or to add dimension to crevices and decorative details. You can apply wax with either a clean rag or a wax brush. They both work just fine, though a brush is better for pushing wax into small crevices and detailed areas. Clear wax only: If you prefer a cleaner, more contemporary look, or just want to preserve the pure color of your paint with a clear protective finish, you can simply apply clear wax on its own. For a grungier, weathered look, or to add depth to recessed areas and decorative details, you can use clear wax and dark wax together. Either apply a layer of clear wax and immediately apply a layer of dark wax on top (while the clear wax is still wet), or you can mix some clear wax with a bit of dark wax on a paper plate and apply the custom-tinted wax. 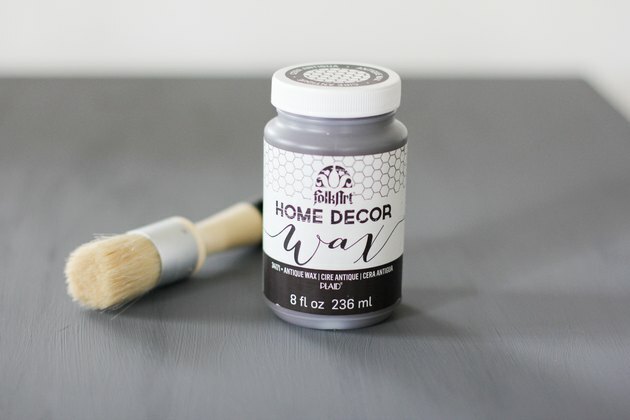 If you are looking to dramatically deepen the color of your chalk paint and/or add some serious patina, you can apply dark wax directly onto the paint. To apply clear wax, dip a rag or wax brush into the wax (a little goes a long way), and apply a thin layer onto the furniture using a circular motion. It's best to work in small sections so the wax doesn't dry before you have a chance to wipe it off. Once a small section has been coated in wax, wipe it off with a clean rag to remove the excess. Wax on; wax off — that's right, á la The Karate Kid. Repeat until the entire piece has been coated. To create a more lustrous surface, you can buff a clean cloth over the waxed surface before it dries until it's shiny — a few passes of the cloth over each section ought to do it. To apply dark wax, you have the option of applying a layer of clear wax first, and then applying the dark wax on top while it's still wet, or mixing some clear and dark wax together and applying a custom-tinted wax. Either way, the clear wax acts as a buffer and gives you more control over how dark your piece ends up. You want to start out using the dark wax sparingly until you get a feel for how dark it will tint your piece. The longer it sits before you wipe it off, the darker the stain. Be sure to work it into all the little crevices and any decorative details. If you find the dark wax to be too dark, you can apply clear wax on top to "erase" it before it dries. It won't take it off completely, but it'll lighten it up. Or you can wipe it off completely with mineral spirits and start again; just don't wipe too hard, or you'll remove the paint. We opted to use this dark wax on its own without any clear wax, which is somewhat of a renegade technique. 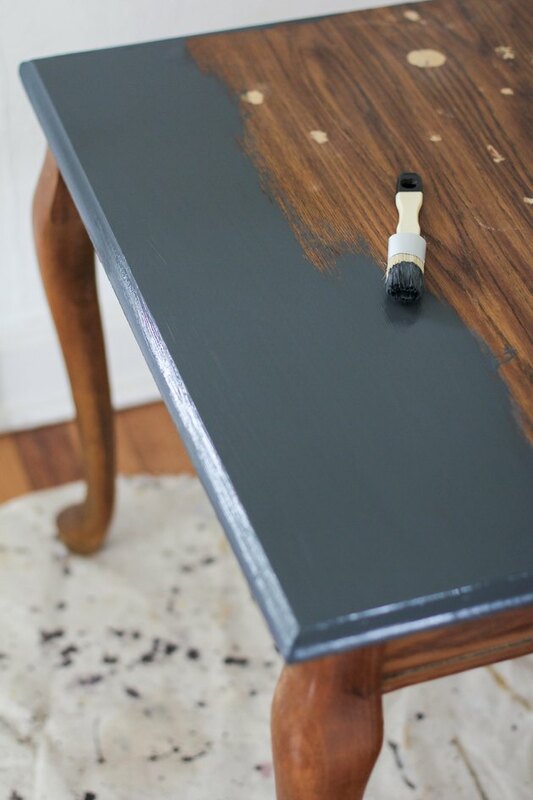 But we wanted to darken the graphite paint color to a richer charcoal shade and give it an aged look. Similar to how you'd apply clear wax, we used a wax brush to apply the dark wax using a circular motion. We worked in small sections and immediately wiped the excess away with a clean rag. Once the whole thing was coated in wax, we buffed it out and immediately fell in love with the results. See how the dark wax sits inside all the grooves of the paint and adds dimension to the corners and little crevices that would have otherwise been lost? Though the wax will feel dry to the touch, it can take between one to three weeks for it to fully cure and harden, so treat your piece with care and use it gently until then. NOTE: It should be pointed out that some folks prefer not to use wax, as it wears off over time and will require occasional re-coating. And if you're painting furniture intended for outdoor use, wax would not be an ideal topcoat — it cures to create a water-repellent surface, but it's not waterproof. A more durable option is to use a clear water-based polyurethane finish (like this or this), which is available in a variety of sheens (gloss, semi-gloss, satin, and matte). 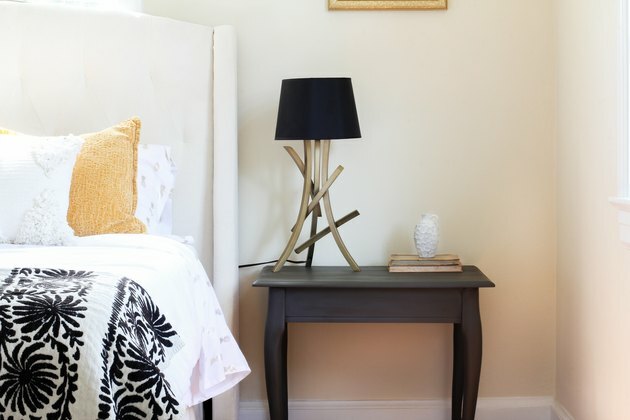 Steer clear of oil-based polyurethane finishes, though, as they tend to yellow over time. Lastly, if you want the protection of a poly but the look of wax, you can also seal your piece with a matte poly finish under the wax, but never over the wax. Wax should always be the last step. 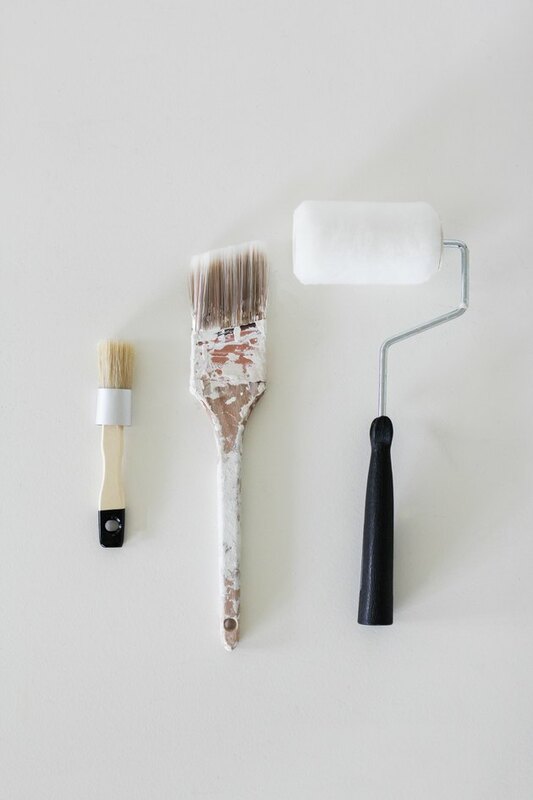 OK, that's officially all you need to know to make you a chalk paint pro. 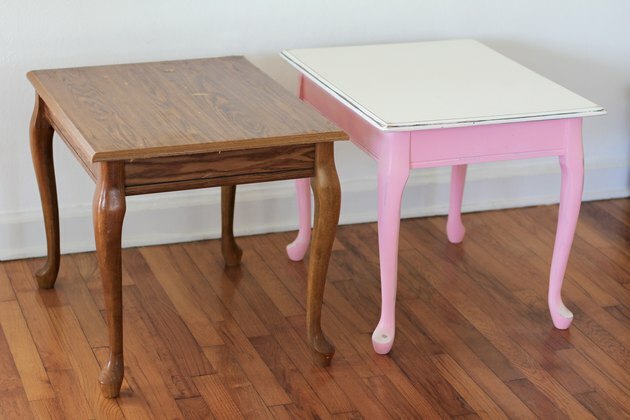 Break out the paint and start making over some furniture!